A naval architect, my son-in-law Jit talks about the need for “redundancies” in design and engineering. Basically, it means you need a back-up plan or remedy in case of a mechanical snafu. 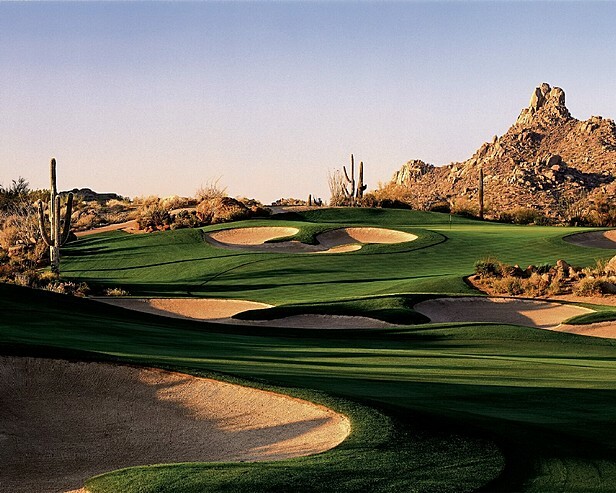 Without knowing it, I packed a redundancy en route to sunny Scottsdale, AZ, the locus of our Golf Road Warrior trip. You see, somewhere in either the Grand Rapids or Dallas/Ft Worth airport or parts in between there’s my lost and forsaken laptop case wailing away and looking for its mommy, my Apple MacBookPro. Fortunately, I have the MacBookPro in my possession but in the heat and hurry of the TSA checkpoints or whatever, my trusty laptop case with the essential AC/DC battery charger has gone AWOL. Sitting next to me on my flight from Dallas/Ft Worth to Phoenix was a young Air Force serviceman, named Mike, who’s been trained as a crew chief for jet maintenance and will be headed overseas shortly. Mike told me redundancies play a major role in F-16 aircraft maintenance. A single engine jet, the F-16 requires a special highly volatile fuel for the emergency power unit in case something goes awry and the main engine starts shutting down. This emergency power unit, fueled by a 56 pound tank, will allow the pilot to fly and land the plane within a ten minute window even if the main engine has shut down. Given that proper perspective, the angst of the missing laptop case suddenly dissipated. Besides, my clubs came off first on the carousel. A member of the Golf Writers Association of America, Terry Moore was the founding editor of Michigan Golfer for 18 years and is now a regular columnist and travel writer for it and several other golf websites. Next April, he'll cover his 35th Masters Tournament. A member of the Michigan Golf Hall of Fame and founder of the West Mich. Golf Show, Moore serves as a Governor for the Golf Association of Michigan and Chair of the Communication Committee. He's also a past co-chair and current member of the Michigan Golf Hall of Fame Committee. I hope you have better luck with your laptop case then Chris has had with her missing checked bag from her trip to Florida two weeks ago. It still has not shown up. Enjoy Arizona! thanks, Russ, but I’m afraid my laptop case has found the same Bermuda Triangle as Chris’s bag.